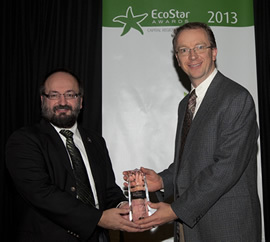 Reliable Controls is the 2013 recipient of the Capital Regional District's EcoStar Community Environmental Award, recognized for work in the category of Integrated Watershed Management. The Capital Regional District (CRD) recently recognized outstanding achievements and contributions by local businesses, groups, and individuals in enhancing the environment through the EcoStar Community Environmental Awards. These awards provide an opportunity for environmental leaders to highlight and demonstrate contributions towards making the capital region of British Columbia a more vibrant and sustainable community. Designed to reflect the diverse and innovative projects underway across the region, the EcoStar awards help the best environmental stewards to shine. Reliable Controls was one of nine recipients in six categories of the EcoStar awards, recognized for its new LEED Platinum targeted head office, which includes design elements such as rain gardens and planters, swales, green roofs, cisterns, and trees – all of which preserve and enhance the natural, surrounding landscape. Prior to redevelopment, the site's storm water drained through the municipal storm drain system without treatment; however as a direct result of the new construction, currently more than 90% of the precipitation is captured and reused for irrigation and flushing toilets, as well as for managing pollution loads and diverting runoff. Reliable Controls and the design team of D'Ambrosio architecture + urbanism, Associated Engineering, and Murdoch de Greeff, along with landscape contractor Paradise Cityscapes are pleased to be recognized for the work in this area.